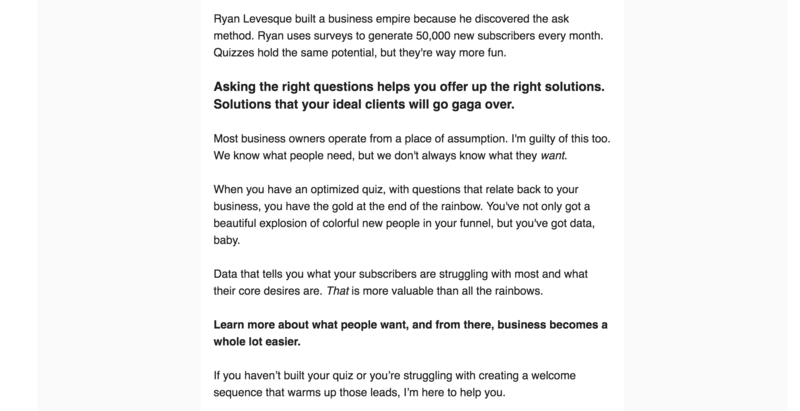 How do you turn a cold new subscriber into a warm lead? I analyzed the emails of over 50 copywriters to find out. I signed up for the email lists of 50+ freelancers. Copywriters, specifically. Not just to learn from them. After subscribing to a list, I didn’t touch a single email from the sender. That’s an important note because smart marketers do list segmenting and link-trigger tagging and all kinds of Smart Marketer Things™ based on engagement with emails – which we’ll get to, hang on a second – and I didn’t engage with any of the lists after I subscribed. I just signed up. And let my subscription ride. And paid attention, as time marched on, to the different emails each copywriter would send me on Day 1, Day 2, Day 3 – you get the idea. Given that a good open rate hovers around 30% (depending on the size of your list), by not opening any of the emails, I basically acted like a solid 70% of email subscribers. 20% of the lists I signed up for never sent me a single email. Yep, no confirmation, welcome, hey-I’m-alive email. I even checked my spam folder, waited plenty of days, switched to a single inbox (no tabs)… nada. Which made me equal parts sad and pissed off. As a freelancer/business owner/entrepreneur/whatever-you-call-yourself, it’s part of your job to sell yourself. You, my friend, are in sales. And your email list can do some of that heavy lifting for you. First things first: what should you base your welcome sequence on? Magical powers live in your welcome email sequence. Use them. Lemme ask you: how many PDF downloads are on your computer? Related: how many of them have you actually read? Email content is (nearly) unavoidable. If you want your content to be read and acted on, an email sequence is your Most Powerful Opt-In. (As a quick aside, an email sequence is also known as an email course – and I’m using those two terms interchangeably in this piece.) 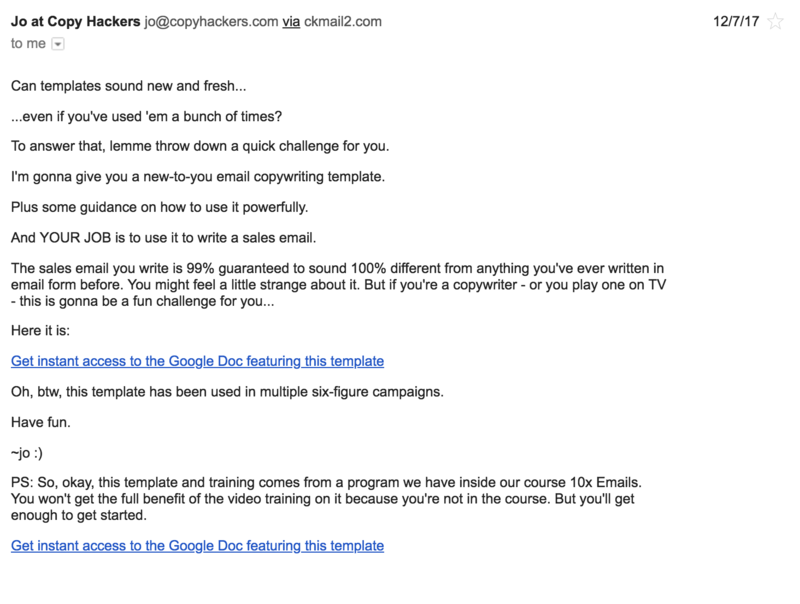 Of the 34 lists I subscribed to, four of the copywriters offer an email course as an opt-in. Ten of the 34 copywriters offered PDFs as their opt-in. This is a problem. A lack of content delivered to your newest subscribers – it’s a problem. In case no one told you: your email list cannot be an afterthought. Ding ding! The answer is #4. In other words, email matters. When you warm up your new email subscribers, send them regular emails and then sell to them through conversations via email, your biz will run smoother, easier and more lucratively. You can get new leads from your list, who know exactly how to hire you. Your top blog posts will drive more traffic to your website because your subscribers are reading and sharing them. You’ll be able to sleep easier at night knowing that you have a mini salesperson on your team now (who barely costs you a dime and works 24/7 – beat that, Fiverr). If you’re sending a single PDF and then throwing deuces like a 20-something at Coachella, you’re doing it wrong. But after you deliver that PDF – usually as soon as someone confirms their opt-in – then drop that new subscriber into a welcome email sequence. It’s like an email course. Just without the  of trying to produce and promote a whole email course. You can get the same intimacy an email course provides without rebuilding your entire opt-in process! 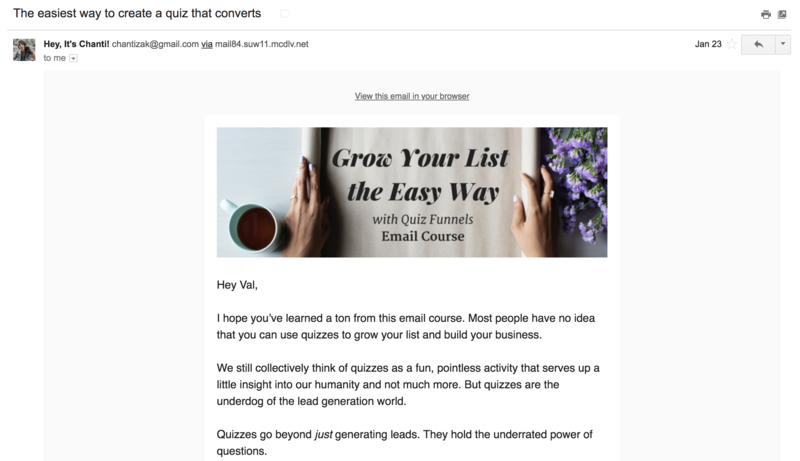 For the purpose of this test, I’ve lumped email welcome sequences and email courses together as their goal is the same: to warm up a cold audience. Most of the major email providers, including Yahoo!, AOL, Hotmail, and Gmail, use engagement-based filtering to help detect spam. This means that the more your recipients interact with your emails by opening, clicking, and reading, the more highly engaged your audience is, and the more likely you’ll end up in their inboxes. Email courses = better overall deliverability. One note is that two of the copywriters – Ben Settle and Brian Kurtz – send daily (or nearly daily) emails from the moment you sign up. So, while there isn’t a traditional welcome sequence in their cases, the daily emails work in the same way: they train their new subscriber to open their emails. Imagine inviting someone over to your house for dinner. Your dinner guest shows up to find the porch light is off and your front door shut. They dare to knock anyway and, when you open the door, you barely say hi. Maybe you take their coat. Maybe you don’t. And you and your guest are left standing there, staring at each other. Trust me: a little house tour and the offer of a drink or snack would go a long way to make your dinner guest feel welcomed. Your email list is the same way. Give them a welcome email sequence and they’ll be happy campers, er, guests. But how do you welcome someone you’ve never actually met? In Email 1, start with a warm welcome and some simple expectation-setting. Your new subscriber doesn’t want to guess what’s next. Tell them what to expect (and remind them again later), and they’ll trust you more with every step. Okay, we got the welcome out of the way and we set expectations. Time to sell, sell, sell – right? The best part of any dinner party is the appetizers. Think about it. You’re starving, you look around hoping for anything to eat besides the orange peel balancing on the edge of your cocktail glass, and there they are: little puff pastries full of gooey brie, dates wrapped in bacon and a whole chips-and-dip situation. What’s a guest to do but dive right in? Your email subscribers want those same appetizers: little morsels they can enjoy that only add to the overall experience. That’s pure value for the reader (with a smart nod to his own work in the process). Pro tip: show up as a leader in your industry by starting something. A Facebook group, meetup, conference or podcast will do. While you might be tempted to dive in with a hard sell in that second email, give it a beat and pour on the value and education. Then move on to what you’ve been waiting for: the delicious main course. Have you ever found yourself stuck when you sit down to write a sales email? Does the idea of selling make you break out in hives? Great news! You can sell without feeling like you’re selling. How? By teaching your readers to do something you’re really good at. (This is the satisfying goodness of your welcome sequence.) With a welcome email sequence, you throw in tons of value by teaching what you’re best at – up front. Zach Spuckler spends a solid seven days teaching what he knows about Facebook Ads before he ever pitches me. And, trust me, after learning the ins and outs of Facebook Ads from someone who’s clearly a master, I just want to hire Zach to write those ads for me. Each of Zach’s teaching emails take a simple approach: get subscribers to click on a link and go to an online course space. It creates an environment that feels professional. And if you click around on that page, you get pretty tempted to buy his full course. You can do what Zach does and link to a page on a website or include all of the teaching right in the email. That’s where knowing your readers, testing like it’s your job (b’cause it is), and figuring out what works for you comes in. Once you’ve given your new subscriber some rock-solid education and value, yes, now it’s time to sell – in your last email of the welcome sequence. Chanti’s email that follows her free course reminds us that, hey, we just got a ton of free value from her. She reiterates her point and why she’s an authority on the subject (in her case, quizzes). She then goes on to set her concept against a well-known, proven system. She adds even more authority by positioning herself alongside a popular brand (the Ask Method). Chanti uses this 7th email in her series to show me exactly why I should hire her to do everything she just taught me to do in the free email sequence that she’s been sending my way. But if you’re diving in on Day One with a sale, you’re going to see subscribers backing away slowly and never opening your emails again. There’s a final piece of your welcome email sequence that not enough copywriters are doing. So sit up and pay attention. You’re missing out on a world of data and personalization moments if you aren’t segmenting your email list. MailChimp’s research tells us that segmented campaigns get 14.64% more opens and 59.99% more clicks than non-segmented campaigns. So ya better be segmenting, mmmkay? Segmenting your subscribers and pushing them into followup sequences that target their interests is just good business. Segmenting is respectful of your subscribers. It tells you who is on your list and how you can help them. And with the number of email marketing tools that allow you to segment, it’s almost nuts if you don’t get segmenting in place pronto (as in, before your email list actually gets big and you have no idea who’s on there and what they want). On a related note, you can create segmenting campaigns with even the most basic email service providers, like MailChimp. I bring this up because the most popular email service provider amongst the list of copywriters I signed up to learn from was MailChimp. 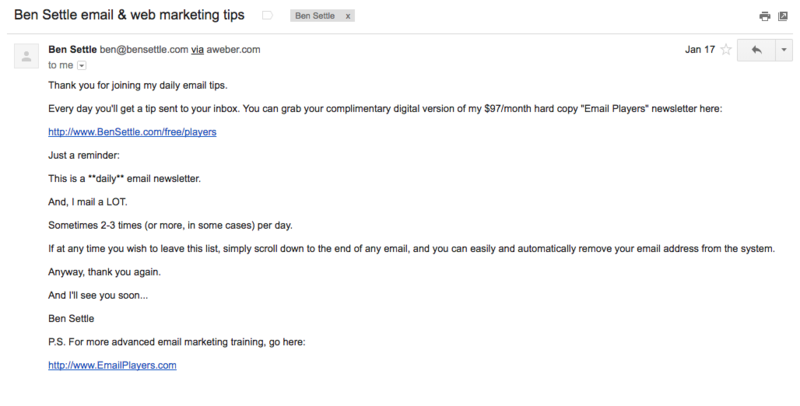 It’s an obvious choice for a beginning email marketer… mostly because of its free plan. After all, if you aren’t going to regularly email your list or sell your products and services to your subscribers, why pay for your email provider? All of the other copywriters I investigated use email service providers that live and breathe segmenting: Infusionsoft, ConvertKit, AWeber, Drip and ActiveCampaign. Yet I only found a handful of segmenting emails. But I didn’t get many others. (Or I’d show them to you.) Which is a shame. Be like Jessica. Segment your subscribers. So your email sequence is planned. But how do you, like, write those emails?? Take it: Can we all just be human… please?? Your readers are real, actual people. Seems obvious, but it’s clearly worth mentioning. Considering how people talk to each other on Twitter/Facebook/etc. these days, I gotta say it. Just because there’s a computer between you and your reader doesn’t mean they are an actual computer. Write your emails like you’re talking to a single person – not a group of people. Let your subscribers pretend that you’re writing just to us! Furthermore, let’s talk about email formatting for a quick sec. Look, I’m not an email designer, but I am a human with eyeballs. And can we all agree that heavily designed (or weirdly left-justified) emails look like marketing emails? They help your email seem more personal (see also: not automated). They’re less likely to land in spam filters. They’re easier to read overall. They’re 4,000 times* easier to read on mobile. Before you send your next email to your list, send a test to yourself. Next, put yourself in a first-time-subscriber’s shoes (ya know, voice of customer and all that) and see if you like opening and reading your own emails. Then try reading it on your phone. You’ll see what I see: text-based is the way to go, baby. Your readers got your sales-focused email (or email course) and you *just know* they’re going to buy now, right? Not yet, dear one. There’s still work to be done. Do you know that, of the over 50 email lists I signed up to, only 8 of those copywriters still email me to this day? That’s right. Most of them got their sales pitch in and then ditched me faster than a speed dating lunch. Look, just because a subscriber doesn’t buy instantly doesn’t mean they won’t eventually buy from you down the road. But they can’t buy from you in the future if they lose touch with you. And this is where you can round out your welcome email sequence to make sure they know exactly who you are and how they can buy from you/refer people to you/bask in your endless glory. Let’s use that dinner party analogy again: what’s the main course without side dishes and dessert? See how she pitches nothing? By adding heaps of value after a sales pitch, Tarzan shows her readers that she’s not just in it for the sale. Instead, Tarzan uses this email to show off her mad copywriting skills, connect even more with her subscribers and get them to invest in who she is – not just what she does. While we’re talking about keeping those emails nice ‘n friendly, let’s discuss an often-overlooked portion of our emails. Oh, Title Case. We love you for headlines, don’t we? But in email? You don’t look so hot. The first one is Title Case. Where Every Word Is Capitalized Like This. The second one is sentence case. Where the words are written just like you’d write a sentence. The biggest reason to use sentence case is that it’s easier to read, especially when the text gets long. Can You Imagine How Difficult It Would Be to Constantly Read Long Titles in Title Case? Title Case on a subject line is a dead giveaway of a marketing email. Do you do this with your friends? No. Stop doing it on your email list. More importantly, sentence case feels friendlier. And a friend’s email is more likely to be opened than a sales email, every single time. Ain’t no party like an email list party ’cause an email party don’t stop. The average attention span is down from 12 seconds in the year 2000 to a mere eight seconds now. That is less than the nine-second attention span of your average goldfish. Are you losing the attention of your email list? It’s easy to take new subscribers for granted, start selling to them right away and get all “market-y” on them. It’s harder – and more rewarding – to teach first, get personal and use the technology at your disposal to make the magic happen. Not to mention the fact that you want to test, gather data and improve on all of it. Did you think it was going to be as easy as checking out the emails of the top copywriters and doing what they’re doing? Well, they’ve at least shown you that even the best can improve. What did an email pro find surprising when she signed up for email lists of 50+ best copywriters? Of course, there are *so many* variations on welcome sequences and every one is a special little snowflake! But with a solid foundation, you’ll knock the socks off of your subscribers and out-run even the top copywriters out there. Now it’s your turn. Go beat them at their own game and report back what you find out about email onboarding.